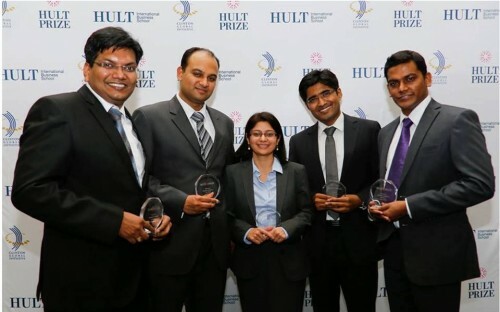 Manish Ranjan led his business school team to victory in the Hult Prize 2014. Now, the MBA entrepreneur has grand plans to help fix India's healthcare system. It has been three weeks since Manish Ranjan steered his team to victory in the Hult Prize final – but there is still so much more work to be done. Manish, an Indian entrepreneur, is trying to solve a pressing problem: under-diagnosis and poor treatment in India’s weakened healthcare system. India’s government spends just 0.9% of GDP on health. A shortage of resources and the urbanisation of India’s cities have left public hospitals and healthcare providers bursting at the seams. Manish, an IT consultant by background, took to business schools to study healthcare management. His MBA program at the Indian School of Business is one of the few in the country that caters for the medical manager, he says. But it is also a business school that is supporting the growing entrepreneurial movement in management education, spurred by the increased optimism in India’s start-up scene. It was while on a healthcare management course during his MBA program last year that Manish formed his dream start-up team. For years, ISB has been entering the Hult Prize, the world’s largest business school competition, but Manish was to bring home the coveted winners’ title. “For a team, we all come from a very diverse background but all had an interest in healthcare,” he says, reflecting on last month’s grand final in New York, presented by former US president Bill Clinton. Today, the venture, NanoHealth, is one of the most innovative social enterprises in India. It is not just a social start-up but a commercially viable business, too – albeit one that seeks to offer affordable healthcare services for India’s urban poor. “This solution has to be self-sustainable – we are a profit seeking enterprise,” says Manish, CEO. Most of NanoHealth’s business will come from the huge urban population that lives in India’s slums. The company has created a network of health workers equipped with a diagnostic tool – a “Dox-in-Box” – which can risk-profile patients for diabetes and hypertension. By incorporating doctors and pharmacies into its network, NanoHealth hopes to become a one-stop-shop for all health services related to chronic disease. “For our counselling and monitoring we just charge $1.5 every month. Most of the time these people are short of funds because they go to doctors when in extreme conditions,” says Manish. By diagnosing early, the start-up hopes to stem the flow of non-communicable disease. The impact of these diseases will cost low and middle-income economies $1.3 trillion over the next 20 years, according to the Hult Prize Foundation, the non-profit organization which runs the start-up competition. It is a good thing that NanoHealth has just banked $1 million in funding, the spoils of battle. “Now, 66% of all premature deaths will be caused by chronic diseases and out of that, 50% is because of hypertension and diabetes,” says Manish. He says that the company will use the investment to expand its pilot across India, but eventually he wants to see NanoHealth in other countries in Southeast Asia, and even Africa. “A good sum of that will also go into R&D [research and development], to reduce the cost of our Dox-in-Box,” he adds. The company also struck a partnership with GVK BIO, Asia’s leading R&D organization, to use its proprietary platform, HEART – Health Emphasized Analytical and Reporting Tool – which is a cloud-based healthcare analytics framework that offers analysis to assist medical support. Its story reflects both the potential and the challenges for social businesses in India’s healthcare industry, which is struggling to meet the needs of the country’s 1.2 billion people. In a report last year Deloitte, the consultancy, described India’s healthcare infrastructure as “one of the weakest” of the developing nations. It warned that the lack of inclusive healthcare is a huge barrier for India’s economic growth. Yet the glaring need for wider healthcare access is spurring new innovations, and presents opportunity for start-up companies. Social businesses – firms set up to provide services at prices affordable to India’s working classes – are seen as a way to fill the gaps in the healthcare landscape. Coupled with one of the world's lowest levels of public healthcare funding, entrepreneurs have emerged to bring the sector back to health in India. “People are ready to pay for a good service, but it’s not reaching them,” says Manish. In India’s small towns and rural areas, patients face an even tougher time obtaining reliable diagnostic tests. But Manish says that NanoHealth will focus on the urbanisation of India’s cities because it is a “huge growing market” – as hordes of people migrate to urban areas, slums will grow and add to the strain on the healthcare system. About 31% of India’s population now lives in towns and cities, according to its 2011 census. NanoHealth’s success will be dependent on its deployment of “Saathis” or “friends” – a network of health workers who are equipped with its diagnostic tool, and who can also provide monitoring services. “We are hiring a lot,” says Manish. He adds that one Saathi can cater to a slum of up to 9,000 people. In a day, Saathi’s can treat 360 patients who are on the monitoring plan by visiting 15 households, he says. But he also sees the management of this network of health workers as the company’s biggest challenge. NanoHealth faced stiff competition from a host of other business schools’ start-ups in the Hult Prize competition, and Manish admits that his company was capital expenditure-heavy in beginning, but says he has been able to reduce the initial costs and has used technology effectively. Only two of the original five NanoHealth team members – Ashish Bondia, a former army doctor, and Manish – are still pursuing the social venture, but they intend to scale the business and expand overseas nonetheless. In an age where corporate careers still rule the roost in MBA cohorts, Manish is confident that the degree has helped him pursue an entrepreneurial path.